What exactly are nature-based solutions? The International Union for Conservation of Nature, defines NBS as “actions to protect, sustainably manage and restore natural or modified ecosystems, which address societal challenges (e.g. climate change, food and water security or natural disasters) effectively and adaptively, while simultaneously providing human well-being and biodiversity benefits”. 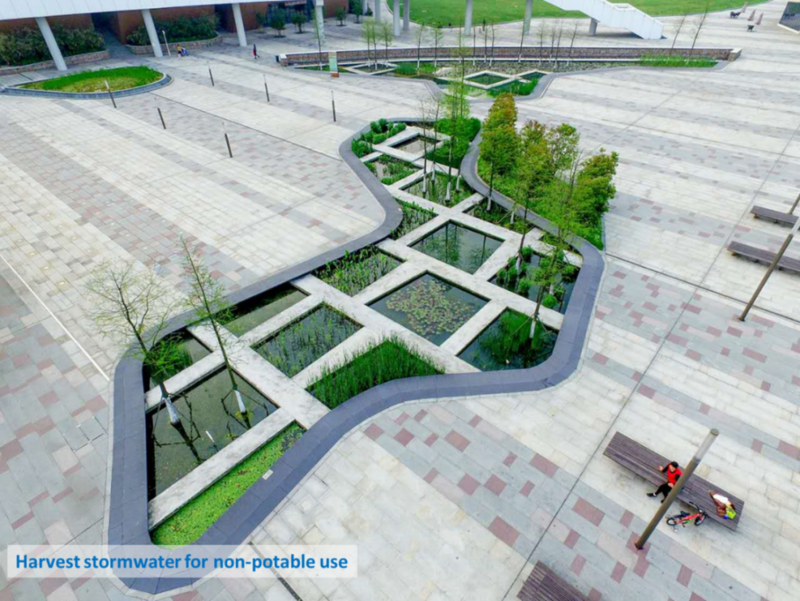 A constructed wetland integrated into the public landscape at Kunshan Culture Plaza Wetland, in China. Read Kunshan’s overarching strategy to develop into a Sponge City. Investment in nature-based solutions is increasingly seen as a way to address local water challenges in both urban and rural settings such as floods, shortages in supplies, more sustainable usage of the resources or degradation of water quality. A range of methods are increasingly being applied at local levels to restore environmental, social and economic benefits provided by ecosystems. These include restoration of watersheds through reforestation, reducing erosion from arable land or protecting riverine riparian zones, recreating wetlands for controlling urban and agricultural diffuse pollution. Approaches such as constructed wetlands can also provide valuable services and benefits with respect to water supply, wastewater treatment and water flow regulation. IWA has a number of Specialist Groups that promote the use of nature-based solutions, and a specific task group for 2018-2020 has also been set up on Nature-based Solutions for Water and Sanitation. To find out the latest on what IWA members and partners are doing on NBS, join the IWA Specialist Groups below or follow the IWA Connect group on Nature-Based Solutions. By 2025, two thirds of the world’s population will be living in water stressed conditions. Meanwhile, the degradation of water ecosystems is occurring at alarming rates. Water utilities and water regulators that choose to play an active role in catchment management are uniquely positioned to help. The International Water Association (IWA) and The Nature Conservancy (TNC) are working together to encourage and facilitate active utility involvement in watershed management and promote stronger connections between water utilities and regulatory bodies. The partnership aims to contribute new insights to the body of knowledge against which NBS can be assessed. Building a robust knowledge base and supporting opportunities for cross-sector collaboration are fundamental to the mainstreaming of these practices. IWA and TNC are developing a publication with a series of spotlights on water utilities studies intended to shed light on the opportunities and challenges facing regulators and water utilities in their efforts to incorporate nature-based solutions into water management. More than five billion people are expected to be without a connection to public sewerage in 2030. NBS can be part of traditional and decentralised wastewater treatment systems, reducing costs and providing other benefits. Rapid urbanisation and population growth are putting an increasing pressure on already scarce water resources, and land. Planned urban development that integrates green infrastructure or so-called nature-based solutions into city planning makes cities more resilient to the impacts of climate change, floods, droughts and other environmental shocks. IWA is a partner on RECONECT- Regenarating ECOsystems with Nature-based solutions for hydrometeorological risk rEduCTion, led by IHE Delft and funded by the European Union’s Horizon 2020 Research and Innovation Programme. The project aims to rapidly enhance the European reference framework on Nature-Based Solutions (NBS) for hydro-meteorological risk reduction by demonstrating, referencing, upscaling and exploiting large-scale NBS in rural and natural areas. Find out more here.